Speak Foreign Languages like European Parliament Chief Translator! THE CHIEF TRANSLATOR FOR THE EUROPEAN PARLIAMENT CAN SPEAK 32 LANGUAGES!!! Learning a new language is one of the most difficult tasks and requires immense determination and hard work…that is for most people. 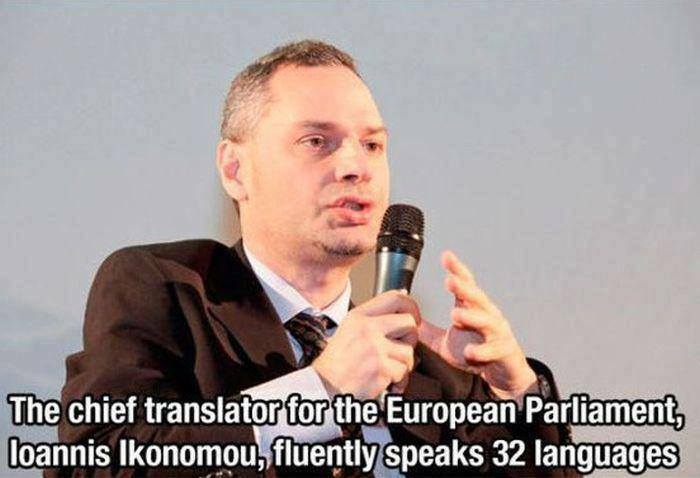 Speaking three or four different languages well enough for conversation is usually considered impressive, yet Ioannis Ikonomou, the translator for the European Parliament, is on another level entirely, speaking 32 different languages fluently! His native language is Greek. At six, he began learning English, which was his first foreign language. Next came German, Italian, and Russian. Soon he was studying languages and cultures every chance he got and can now speak such obscure languages as Latin, Old Persian, Sanskrit, and Irish! He can speak Chinese fluently and was recently sent to Beijing to translate important Chinese documents and is the only man whom the European Parliament trusts enough to do so! He says the key to learning a new language is to fall in love with it, study the people and different foods they eat, and immerse yourself in the culture entirely!